The Lewistown Drug Store was located at 324 W. Main on the corner of Main and 4th Ave. North (H & R Block). It is one of the oldest buildings in Lewistown, being built in 1885. The ad for the drug store on Aug. 18, 1887 stated: “the only drug store in Judith Basin; drugs, chemicals, patent medicines, fancy goods, toilet articles , full line of stationery; we make a special inducement in childrens’ toys, playing cards, croquet sets, fishing tackle, the leading periodicals of the day received weekly. Imported and domestic cigars. Norman and Hanson (local Dr.), owners. (Fergus County Argus). Later, in 1904 it was called the Delzell Drug Store (John Delzell) and in 1908 it was the W. G. Phillips Drug Store. Through the years various other drug stores were in the left side of this building: MacMurray Drug Co, 1925, People’s Drug (1930-1944), in 1947-1971 it was Ricker’s Drug Store and in 1972-1976 it was Dempster’s Pharmacy (James Todd, Manager). In 1977 the Denim Patch (Callie Jenni) had its clothing store there. On the right side of the building was “The Fair” which sold notions with Will W. White as the proprietor. In July 23, 1912 “Jack Watt and Chauncey Fowler opened their new place, the Alta, for business, already have a good assortment of newspapers, magazines, candies, nuts, etc.,… They are occupying the building recently occupied by The Fair.” (July 23, 1912 Fergus County Democrat). 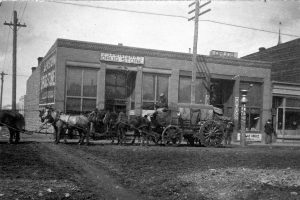 In 1914, Fritz Race bought Fowler’s half interest in the Alta Store. In 1908 the Gilt Edge Stage Line owned by James A. Harris had its office in the back of the building. It went daily to Gilt Edge and a round-trip ticket was $2.50.